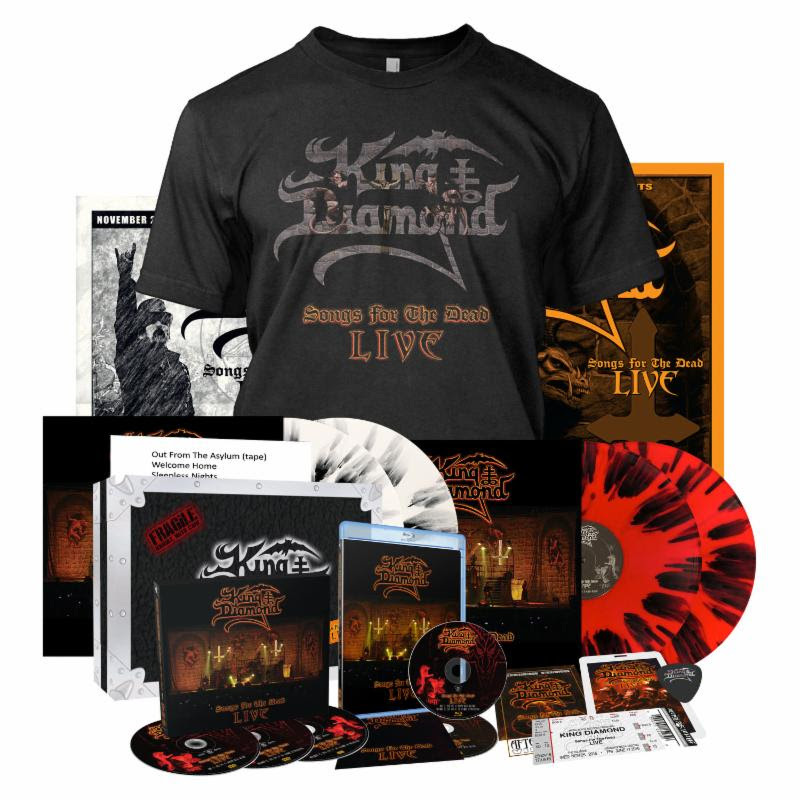 King Diamond, one of the most controversial and divisive metal singers to appear since the term “heavy metal” was coined in the 60’s, is back with a long awaited live offering, Songs For The Dead Live. Recorded in two different dates of his most recent tour, this release features highlights of King’s solo career, a selection of Mercyful Fate cuts, and the album Abigail performed in full. 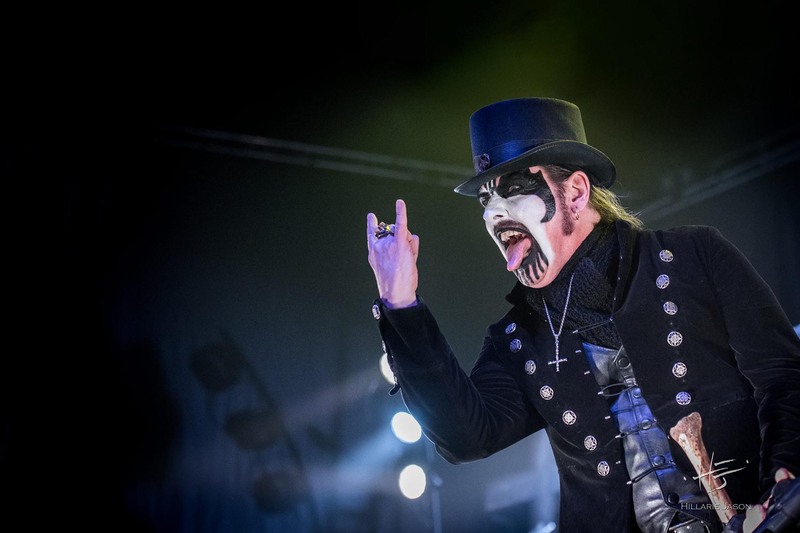 A lot has happened in King Diamond’s life in the last few years: after undergoing a triple-bypass surgery in 2010 which required a lengthy recovery period, he made a triumphant return to the stage on Metallica‘s 30th anniversary show at the The Fillmore in San Francisco, in 2011. A few tours followed, and in 2017 King and his wife Livia Zita welcomed their first born – and no, King didn’t name him Lucifer but Byron. With such a busy schedule and so many personal matters on the way, it’s understandable that his studio output has taken a back seat: his last studio album is 2007’s Give Me Your Soul…Please. But King is showing signs of wanting to catch up for the lost time, and the first step in this journey seems to be the new live release. January 25th brings us the gorgeous Songs For The Dead Live, which documents King’s appearance at the Graspop Metal Meeting in Dessel, Belgium on June 17, 2016 and another from November 25, 2015 at the Fillmore in Philadelphia. Rumors about this release have appeared on the net for more than two years, and now the time has come for fans like me to finally appreciate it. I got into King Diamond almost by mistake: on the second half of the 80’s, I’d go to record stores in Brazil, stare at the cover of Mercyful Fate‘s Don’t Break the Oath and be scared to death. Then I realized that King Diamond had his own solo career at that point, and looked up the story of Abigail. For some reason, it seemed less satanic, and the fifteen year old catholic me seemed OK with the imagery of horror he portrayed in his solo career. I decided to purchase Abigail, and was hooked from the get go. In hindsight, I think my poor command of the English language at the time helped to disguise how evil King‘s lyrics were, and I felt OK with it. How else would I be fine with listening to an album that starts with the burial of a possessed and mummified baby? But anyway, I purchased Fatal Portrait next, and was later mesmerized by the characters of Grandma, Missy and Dr. Landau on Them and Conspiracy. I remained an avid follower of King‘s output, but of course I have a soft spot for Abigail, my gateway album into King’s world of horrors. Unfortunately, I could not catch his performance of that album in full when he played in Brazil in 2017, so the new release comes in handy – there are so many cameras and so many unusual angles captured on the video, that watching it comes very close to conveying what it’s like to be on the first row of the shows. While the main attraction in this release is the full performance of Abigail, Songs For the Dead Live also presents staples of King Diamond’s shows, such as “Welcome Home”, “Halloween” and “Sleepless Nights”. And although at the time of release The Eye was perceived as a step down from Abigail and Them, it sure is nice to see some love for that album, with “The Eye of the Witch” being represented here. Highlights of Mercyful Fate‘s catalogue, “Come To The Sabbath” and the ballad “Melissa” are also included. And when I say ballad, I don’t mean to imply any similarity to Toto’s “Rosanna” or Europe’s “Carrie”. No siree, this is a different ball game: “Melissa” tells the twisted tale of a witch burned by the inquisition, and King mourns his absence. The first thing I was curious to find out when I checked out the album was how King’s voice would hold up after so many health issues and after being a smoker for so many years. Surprisingly, it still holds up – evidence of that can be heard all through the album, not least of all on the very first notes he sings – “Grandmaaaaa…welcome hoooome!!!!”. Yep…he’s still got it, and then some! At 62 years of age, it seems that quitting smoking has helped him regain control of his singing abilities, because he’s sounding considerably better than he did in the tours prior to his heart procedure. And he’s helped here by his wife Livia, who provides backing vocals on his shows. Her voice compliments King‘s and adds depth and sustain where required. The falsetto register may trick the listener sometimes into thinking she’s not doing much, but that’s even clearer evidence of how well their voices blend together. On the strings department, it’s worth mentioning the almost telepathic interactions between the criminally underrated Andy LaRocque – King’s longtime writing partner in his solo career – and Mike Wead. The production highlights the crushing aspect of their playing, and the trade offs between the two almost steal the show. The bass sound is also crisp and clear, and the Sweden born Pontus Egberg does not simply hold the bottom end, but also takes prominence through many songs, most notably on the verses of “Sleepless Nights” and on the chorus of “The Eye of the Witch”. And as much as I miss Mikkey Dee’s contributions in King’s early albums, he seemed happier with Motorhead and now with the Scorpions. The drumming stool has been a hot seat in this band, but judging by this release, I honestly hope Matt Thompson is in it for the long haul: he does a stellar job with the old material and adds his own flair and weight to those songs. His standout moments for me were on “Arrival” and “The Black Horsemen”, coincidentally the first and last track of the Abigail suite. My only criticism of this live offering, if any, would be the set-list. I get the intention of showcasing the performance of two different nights, and the Blu Ray editing in done cleverly enough to avoid the same angles and shots on both shows, but it wouldn’t hurt if different songs were played here and there. Why not including Mercyful Fate’s “Curse of the Pharaohs” or “A Corpse Without Soul” in one of the nights, and/or bringing out something from King’s output after 1990? The set-lists from Graspop and The Fillmore are exactly the same, and there are hardly any changes in the performances in the two nights. That’s a small complaint though, and visually, I can understand why both shows are included: the live settings are remarkably different, with the Graspop obviously being a festival show, and The Fillmore having more of a qualified audience on a smaller venue. As mentioned before, there are some rather unusual angles used in this Blu Ray, with cameras located on Grandma’s wheelchair and on Abigail’s coffin, for example. The massive stage looks like a satanic church, with stained glass, inverted crosses and evil gargoyles on both sides, and the wide angle shots are a sight to behold. Who knows what King Diamond’s next steps will be, but a new studio album is expected for this year. At some point he hinted at the idea of writing a horror story influenced by his recovery period in the hospital, but we are yet to see if this will come true. One thing is for sure, though: just like any of his albums, after the last note is played you will notice a dark cloud hanging over your bedroom – watch out, because the ghost of Abigail could be ready to possess you! 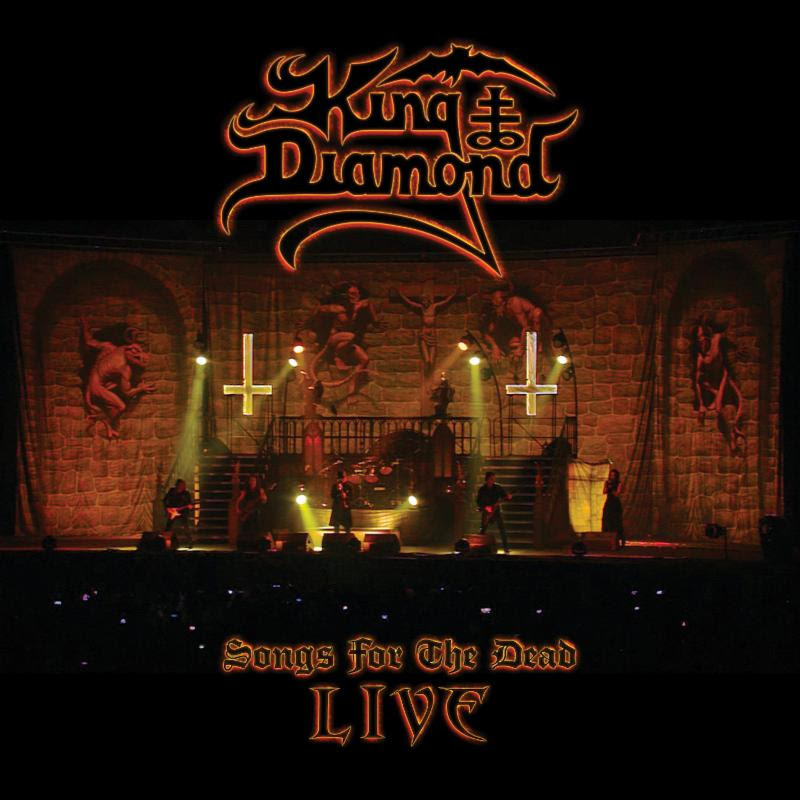 The new year could not have started on a higher note: “Songs For the Dead Live” is a great addition to King Diamond’s catalog, and the importance of this release cannot be overstated. King gives a nod to the past with this crushing release, while he gets into gear to write and record a new studio album. Allow yourself to be engulfed once again in the darkness of Abigail’s story, and experience also other highlights of King’s lengthy career. This is already a strong contender for best live album of 2019. Hi. Andy LaRocque was never in Mercyful Fate. You are absolutely right, correction made! It’s Songs for the dead…not from the dead. I’m kind of surprised it isn’t in a 5.1 audio mix, anyone else notice? Yes! King was never king in terms of technical sound quality, but his sound quality, … awesome!! !